I mentioned in my last post (briefly) that one item of Christmas knitting wasn't completed. That would be the Wine and Roses Mitts for my sister. 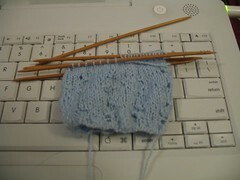 Instead of completed mitts, she got a ball of cashmere lace-weight yarn and a picture. I've got this much done so far, and I must say that they take quite a bit more attention than the Fetchings did! 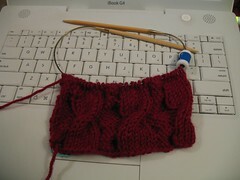 I've also begun the His/Her Reversible Scarf from Cables Untangled, for the Red Scarf Project. Actually, it's a variation on the pattern - I'm making it narrower - 36 stitches rather than 48. It out of Plymouth Encore Worsted, so it will be washable. These two project need to get done! I also have two February babies to knit for, so I need to continue knitting frantically. I think I'll make the Mason-Dixon Baby Kimono for one, but if anyone has a nice, easy baby sweater pattern, feel free to suggest something for the other. But remember these ruffle-topped socks? Risa mentioned that she was knitting some socks from the same yarn, Lorna's Laces Shepherd Sock in Black Purl. It reminded me of these, which I haven't touched since early November. 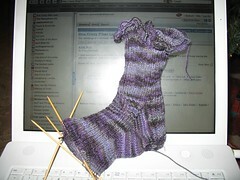 I'm through the heel on the first sock, and now I really, really want to get back to them!